PECOTA does not hate your favorite team. PECOTA is a collection of algorithms, written in computer code and run by an unfeeling machine… these are PECOTA’s estimates of what would happen if the season were played thousands of times. PECOTA is not infallible, and the season is played but once. It is a prediction, not destiny. Diving right into it, the Nationals are 100% money-back guaranteed to have an 88-74 record, 3 games up on the second place NL East team, the Braves. While 88 wins may seem low considering they won 86 in a disappointing 2013, it still wins them the division so quit your whining. Starting with the position players, here is what the machine predicts for each guy. I’m not gonna give you each and every number, of course, because Ben Lindbergh would have to come after me. But I’ll pick out some ones that are interesting to me. I’ll also look where their predicted offensive value (VORP) ranks in the NL, by position, in the delicious PECOTA weighted-means spreadsheet. C: A predicted decline in Wilson Ramos‘ power is certainly reasonable. But at 26 years old, it might not go down as much as his history indicates. PECOTA puts him as the 10th best C in the NL by VORP, and while he hasn’t put it all together for a full season yet, but when he was healthy, he looked better than that. I’ll take the over on their prediction. 1B: Adam LaRoche is going to be 35 this year, his numbers should decline. Unless, of course, he plays less against lefties and basically plays against only righties. I’ll hold on to my hopes that he ends up mostly in a platoon by May or June, and that will make his numbers look better even if he isn’t any better of a player. The spreadsheet spits out a 21st place for his VORP rank among NL first basemen. It’s eye-opening to see how bad they predict his offense to be, behind such luminaries as Tommy Medica, Mauro Gomez and Allan Dykstra (who may not get enough PAs to pass him, but are still better players in this simulation). 2B: They see a slight improvement across the board in AVG/OBP/SLG for Anthony Rendon. We can quibble about how much he’ll improve in his age 24 season, but his numbers are good enough to put him 6th among NL 2Bs. And while PECOTA can do some math to factor in a breakout, if it happens these numbers will be underestimates. 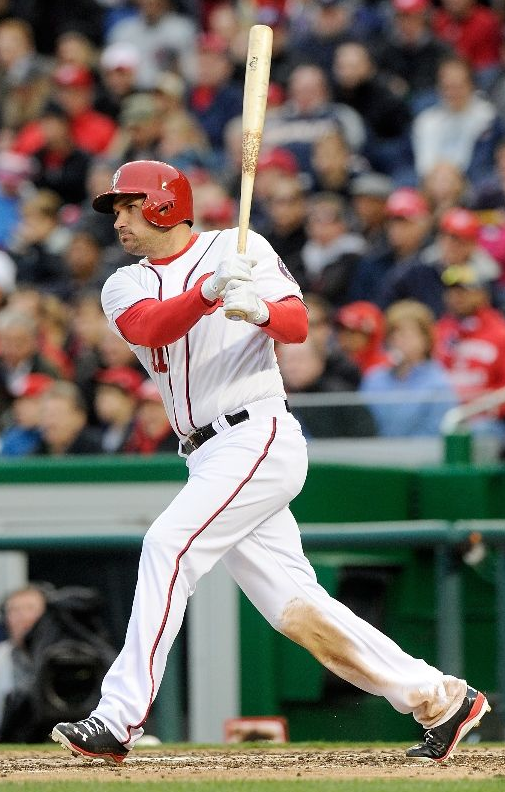 3B: Ryan Zimmerman is predicted to basically repeat last year’s AVG/OBP/SLG, and that seems right to me. SS: I‘m not going to sit here and tell you I don’t believe in Ian Desmond. After what he’s done not just last year, but the last two years, that would be foolish. But they see a perfectly defensible decrease in OBP and SLG, putting him 5th among NL shortstops… behind some real studs. Which still puts him at amazing. CF: For Denard Span, they see a little higher OBP and a little lower SLG for next season. Hard to argue with either one of those. RF: A regression for Jayson Werth is probably inevitable, but… they give him a .356 OBP and I just don’t see that happening. His awful 2011 (.330 OBP) drags down these calculations, but other than that year, the last time he had an OBP below .370 was his first year as a Phillies, with a .363. The power was probably unsustainable, so I won’t argue there. They put him as the 4th best RF, behind Braun, Stanton and Puig, which seems right to me. These predictions are, for most players, regressions. I can see why they’d believe that for Desi and Werth, as well as Desi (for a different reason). But I aint buying it on the others. Count me in on the over bet for Harper and Ramos, at least. Throw in Werth, too. Stephen Strasburg is predicted to be a serious Cy Young contender this year with a 2.59 ERA, 3rd among NL starters behind Kershaw and Jose Fernandez. He’s also the only NL starter, at least in the top 50 or so that I saw, with a K/9 over 10. Beast, is what they’re calling him (well, not in so may words). This is almost the best case scenario, but his peripherals are good enough that the machine tells us it is so. According to PECOTA, Gio Gonzalez basically repeats last year’s performance, and that’s a realistic projection to me. He’s ranked right 14th in WAR among NL starters, which works for me. His 2012 is a high-water mark, and there’s always room for a repeat of that, but if he does repeat 2013 that would be spectacular. Right behind Gio is Jordan Zimmerman, ranked 15th in WAR. This one might be an undersell – his 3.50 ERA projection is based on his unglamorous peripherals. But he his ERA was 3.25 last year – and that’s his highest mark since his second season, 2010. He’s one of those guys that outperforms the projections, every season, and I think he’ll continue that. Doug Fister might be a little difficult to project because he’s moving leagues, but he also doesn’t strike out a ton of guys. They rank him as 24th best pitcher in the NL, which would be a big drop from what he’s been doing in the AL. If he keeps doing what he’s been doing, he’ll be more valuable than that. As for the other potential 5th starter, Tayler Jordan has similar value to Ross Detwiler, while Nate Karns looks better than them both. His ERA of 3.98 beats them, and his just-positive WARP trumps their 0.1’s. Why is this? My gut tells me Karns will do worse than Det and Jordan. But Karns struck out a ton of guys in the minors, without walking many, and that is likely one of the best predictors of future performance. It might show the weakness of the system, or maybe that Karns is ready to surprise us. While a team OBP of .317 seems only so-so, it’s actually a really lofty prediction, also good enough for 3rd best in the NL. To round out the rule of 3s, the Nats are also projected to give up the 3rd fewest runs in the NL. There may be some contention to this, as the probably have the best pitching staff in the league, maybe in all of baseball. But they only rank behind the Dodgers and the Giants, who have good staffs but play in pitchers parks for 82 games plus another significant number touring the NL West ballparks (except for the one in Denver). They think Danny Espinosa could actually make a recovery, hitting .227/.293/.372. This is interesting because if he does recover he’ll likely do better than this, and if he can, he’ll probably do much worse. I’m not sure these numbers are actually in the realm of possibility. As much as I love these prediction machines, and thanks to my BP subscription, PECOTA is the one I know best, they’re still a bit wacky to me. For example, they predict Ryan Zimmerman to have 534 PAs this year. I kinda get it – he’s had some injuries in the past, even last year, and so if they simulate 1,000, for some of them he’ll get hurt, and this is an average of those seasons. But compare him to Troy Tulowitzki, who is all of 12 days younger than him. Zim has had over 600 PAs for 4 of the last 5 years, Tulo for only 2. In his one non-600 PA season, Zim had 440 PAs, still 2/3 of a season. 2 of Tulo’s other seasons had 500+ PAs, a good number, but in his other shortened season, he only had 203 PAs, about 1/3 of a season. So over the last 5 years, Tulo has averaged 496 PAs, while Zim has averaged 602. Why does PECOTA then think Zim is going to have 60 fewer PAs? I have no idea, and these sort of discrepancies really puzzle me.